If interfaces have not been configured with IPv6 addresses yet, use fc00:1:1::/64 as the network-ID and ::x, as a host ID (where x=router-ID). Pic 1. IPv6 and IPv4 Topology Diagram. You no longer have to support other protocol while connecting the IPv6 networks in our topology (pic. 1). 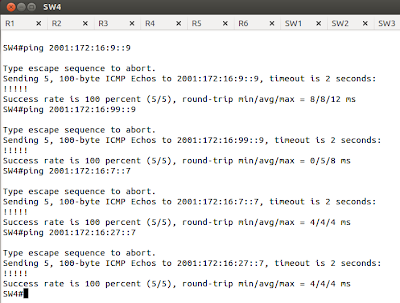 Reconfigure previous labs in such a way that the tunnel allows only IPv6 over IPv4 between R1 and SW4. Configure IPv6 and IPv4 addresses, RIPng and EIGRP AS 1, according to the topology diagram (pic. 1 above). On R1 and SW4, advertise their loopback0 interfaces in EIGRP. Configure R1 and SW4 in such a way that IPv6 subnet in VLAN 215 can reach IPv6 subnets in VLANs 7, 9, 27, 79, and 99. 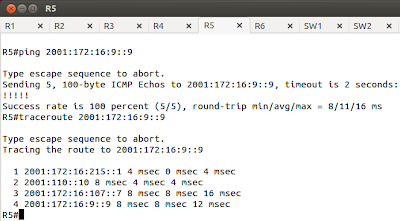 Ensure that the tunnelling method can carry packets other than IPv6 (for instance IS-IS based on CLNS protocol). Tunnel should be based on the R1's and SW4's most stable interfaces. 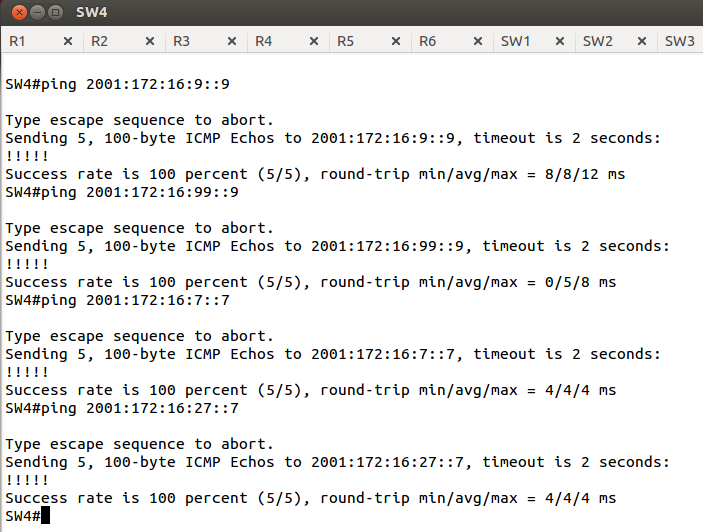 You can add two new IPv6 addresses to make the solution work. 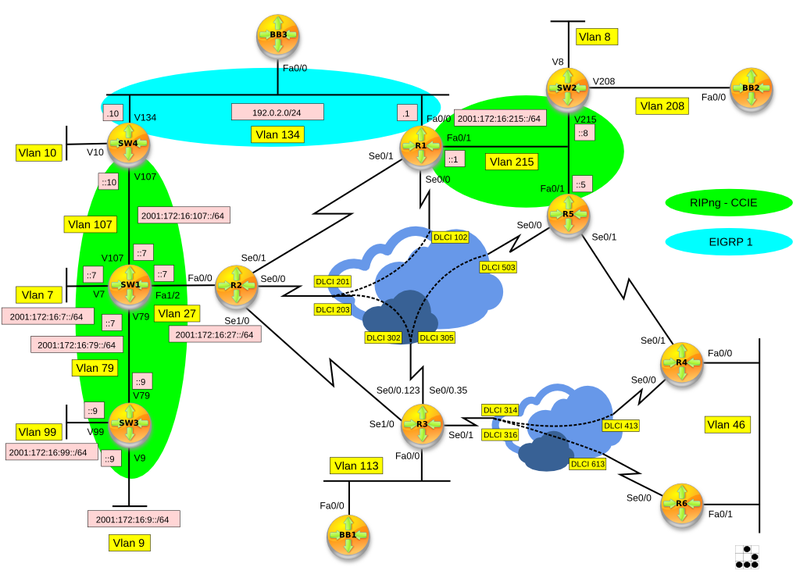 Configure IPv6 addresses, RIPng and EIGRP AS 1according to the topology diagram (pic. 1 above). On R1 and SW4, advertise their loopback0 interfaces in EIGRP. Step 1 - RIPng Between SW1, SW3, and SW4. Step 2 - RIPng Between R1, R5, and SW2. Pic. 3 - EIGRP Adjacency. Pic. 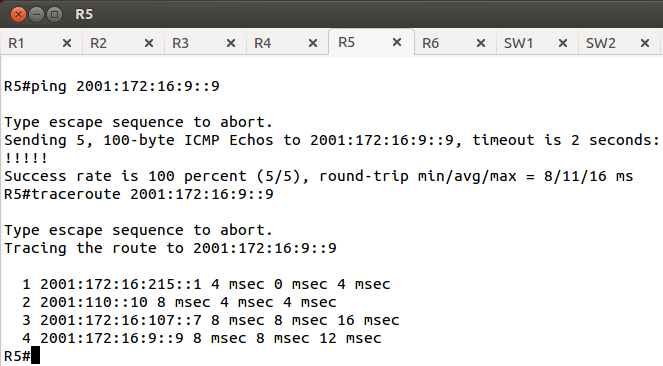 4 - Ping between Loopback (for tunnel puporses). Pic. 5 - Ping Connectivity Test.